20.5.2015. By Stop FGM Middle East. The shock was great when the Iraqi Kurdish Xelk Media Network reported about a Kurdish Mullah promoting female genital mutilation (FGM) on May 8th. Not only did Mullah Ali Kalak stress that Islam allows “female circumcision” but he demanded it to be done for the wellbeing of girls, claiming non-cut girls would enter illicit sexual affairs. Thus, the religious teacher was openly calling on people to break the law. FGM is illegal in Iraqi Kurdistan since 2011 when the government passed law No. 8 against domestic violence including FGM. WADI has been campaigning against the practice since 2006. Since last year, this campaign has been widened immensely with the support of Unicef and the Kurdish Regional Government. Religious leaders have repeatedly supported the struggle against FGM and denounced the practice harshly. With Mullah Ali Kalak taking the opposite path, outrage was great among Kurdish human rights organizations but also within government and parliamentarian circles. Mullah Ali Kalak is not the most important Mullah in Iraqi Kurdistan, but he runs the small but popular “Nabawi Clinic” near Erbil where he treats a wide range of illnesses with unorthodox methods such as camel urine. He further demanded, that girls should be circumcised according to the sayings of the prophet. “The Prophet of Islam says that a woman’s body is cold and a man’s hot… That extra flesh which is cut must not be longer than one millimeter. It is natural, otherwise cutting more than that displays them to problems. Hence, the person who conducts FGM should be carrying a special license”. The Mullah’s logic may seem incomprehensible for those familiar with the topic. Why should a woman’s body be mutilated because it is “cold” according to the prophet? Why should the one who fights mutilation be spoiling the image of Islam? The one who calls for such mutilation in the name of Islam certainly tarnishes that image much more. Yet, despite this reversed logic there was great danger that the Mullah who has a popular Youtube channel would influence his followers some of whom travel from far away countries to be treated by him. WADI and its partner GENDER Org in Erbil debated: How should we react to such public statements? In the end, we decided not to sue him or to call on the government. 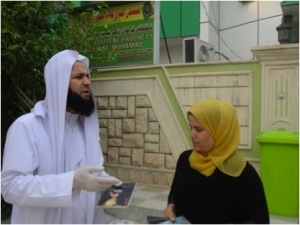 The coordinator of Gender Erbil, Kurdistan Rasul, paid a visit to Mullah Ali Kalak on May 14th. In the end he promised not to refer to “this topic anymore. The people can stop FGM since it is not obligatory”. By hannahcaroline36 in News, Project Updates on 2015/05/20 .